On Valentine’s Day, the general manager of the Nevada Irrigation District (NID) will be the guest speaker at a breakfast hosted by the Nevada County Association of Realtors. The event is titled For the Love of Water, and Remleh Scherzinger is expected to speak about the proposed Centennial Dam project (aka Parker Dam, Centennial Reservoir and Power Project (CRAPP), Centennial Reservoir, and currently Centennial Water Supply Project). How he will weave the love of water theme into his discussion of the project is indeed a mystery. It’s difficult to understand how anyone who wants to completely destroy a 6 mile stretch of Bear River canyon can have love as a driver. I plan to be in attendance, eager to hear about NID and Rem’s love of water. I’ll have with me the same heart shaped rock I brought to the NID Board Meeting on Valentine’s Day last year, where I asked each director to hold the heart for a moment, requesting they lead with love. I found the heart rock along the Bear River in the proposed inundation zone on Valentine’s Day 2017, the very same area where in 2004 Republican Governor Arnold Schwarzenegger signed the Sierra Nevada Conservancy (AB 2600) into law saying, “The 25 million acres within this Conservancy are a gift to the people of California. With this bill, we issue our declaration that our children and grandchildren will see and enjoy the same Sierra Nevada that we value so much today.” He led with love that day, challenging future leaders to do the same. Perhaps Rem will finally be applying love, not for himself and the idea of getting a dam building feather in his cap, but for the greater good of all who live in the Sierras. Perhaps he will admit there is no loving pathway possible when you are threatening to take someone’s home, either through eminent domain or with chainsaws and masticators. Perhaps he will share how after years of discussion and debate, love has finally prevailed, and the Parker Dam project is to be shelved for good. Because of his love of water, perhaps Rem will unveil the Bear River Centennial Park Preserve, to show that NID, as a public agency, clearly does have the public in mind, really does understand that the best way to honor 100 years as stewards of water, is to give back, rather than take more. Perhaps he will finally see that the legacy left to future generations of a preserved recreation area, along a vibrant river canyon, with free access for all, is by far the best way to demonstrate a true love of water. Love, like a river, will cut a new path wherever it meets an obstacle. Perhaps, just perhaps Rem will end the NID stagnation, and finally flow in a new direction, proving his love of water and ability to be the leader this community truly needs. We shall see. Thank you Karen. The Bear River truly is a unique and valued treasure of our community. It provides a necessary riparian habitat corridor between the two existing reservoirs on the Bear River for wildlife, mid-elevation forests and native plants which thrive in this area and contribute to the health of this watershed. With its easy access, multiple hiking trails, varied recreation and beautiful scenery it’s definitely a river valley worthy of love and preservation. Thank you Karen and Stephanie! We love flowing water because it embodies the very nature of love. The CD is stagnation personified along with killing what’s left of our beautiful Bear River. I will be there on Thursday, with a large Valentine heart that says “NID Loves Our Bear River” nudging Rem to do the right thing. I will share this at the NID board meeting on Wednesday, as well. 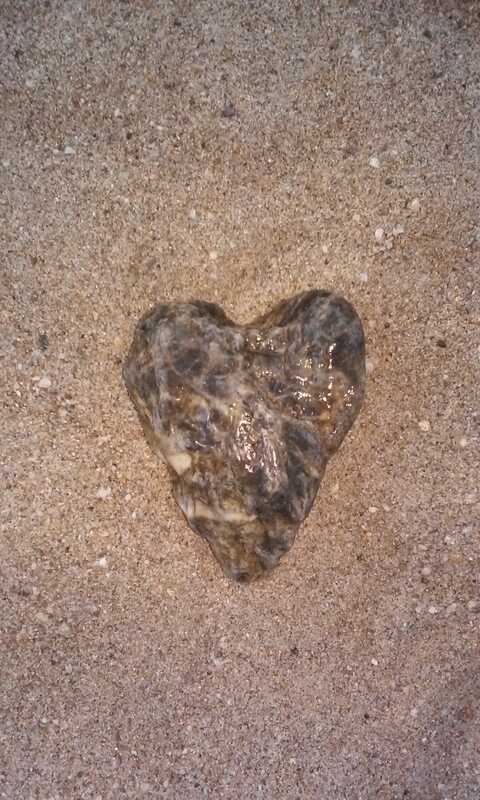 Love your heart rock, Karen. It says so much. Karen writes in her article that she will be in attendance at the Valentine’s Day event hosted by the Nevada County Association of Realtors. This morning, she and I were informed by the realtors that we were not welcome at the event and that our tickets would not be honored. The person set to attend from SYRCL was also dis invited. We politely informed her that we would be in attendance, inside if possible, outside in the public space at least. Come out in the rain and stand with us. We’ll be there starting at 730am with a guaranteed group of peaceful, experienced activists to offer balance and representation. The Bear River must be represented and we intend to offer our best effort to the river we live near and love. This is not a SYRCL event. We’re just people in the collateral zone. Thanks.